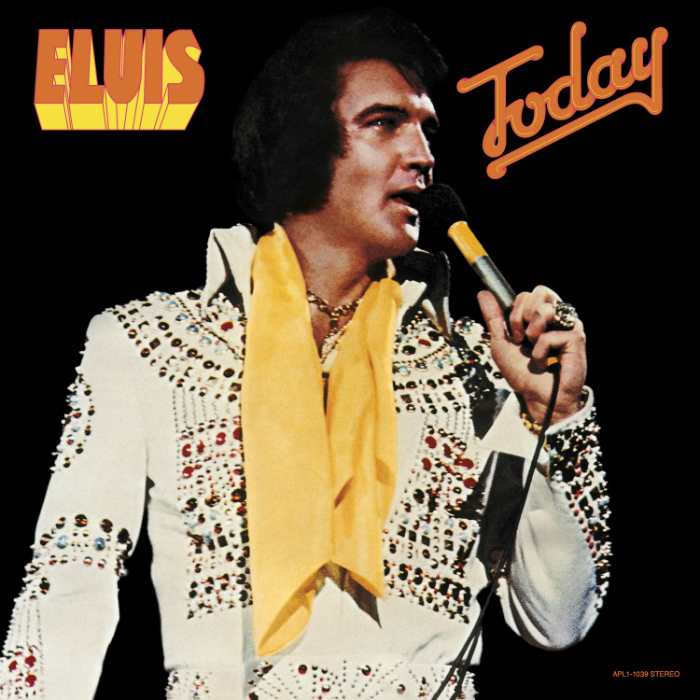 Legacy Recordings, the catalog division of Sony Music Entertainment, and RCA Records will commemorate the 40th anniversary of Elvis Presley’s last major studio sessions with the release of a newly expanded definitive edition of Elvis Presley’s Today (Legacy Edition) on Friday, August 7, 2015. The 40th Anniversary Today (Legacy Edition), the last studio album to be released during the King’s lifetime, contains the entire original album (first released on May 7, 1975) while premiering 10 un-dubbed mixes from the sessions, providing a new intimate listening experience. Now, for the first time on an official release, fans can hear Elvis’s pure unvarnished performances of these songs (recorded March 10-12, 1975), freed from the controversial “countrypolitan” overdubs on the original 1975 release and compare them to the more polished versions of the finished album. Today (Legacy Edition) is available for pre-order on Amazon. Today (Legacy Edition) includes a bonus disc of rare and collectible concert performances recorded live during May and June 1975, the period immediately following the original release of the album. Elvis Presley’s Today was recorded in RCA’s Studio C in Hollywood in March 10–12, 1975, and, though no one knew it at the time, it would be the last time Elvis would lay down tracks in a major recording studio. Studio C marked the spot where the King had recorded his Gold record smashes, “Burning Love” and “Separate Ways,” in 1972 and Elvis had handpicked a remarkable repertoire for this 1975 studio album return. Among the material chosen for the album, Elvis selected Don McLean’s “And I Love You So” and the Pointer Sisters’ “Fairytale,” songs he would perform in concert up until his passing in August 1977. Today (Legacy Edition) opens with the album’s first single and Top 40 hit “T-R-O-U-B-L-E,” an unadulterated full-on rocker, penned by Jerry Chesnut (who also wrote the album’s “Woman Without Love”), which signaled a return to raucous form for the King. Rounding out the original Today were “Bringin’ It Back,” the album’s second single, and covers of songs recorded by Perry Como, Billy Swan (“I Can Help”), Faye Adams (“Shake A Hand”), the Statler Brothers, Charlie Rich and Tom Jones (“Green, Green Grass of Home”). The 40th Anniversary Today (Legacy Edition) is the latest in a line of successful Legacy Edition reissues of key Elvis albums from the 1970s, among them On Stage, Aloha From Hawaii Via Satellite and Elvis Recorded Live On Stage In Memphis—plus the special collections, Prince From Another Planet and Elvis At Stax. The final mixing and overdubbing of the original Today, recorded with musicians outside of Elvis’ road-tested TCB Band, would become a point of contention between the artist and RCA. These sessions would turn out to be Elvis’ last in a traditional recording studio. The smattering of new recordings that would comprise his subsequent output over the following two years would take place either live in concert or in Elvis’ home studio at Graceland. Originally released in 1975, Today was the last studio album from Elvis Presley. Now, in 2015, with the release of the 40th Anniversary Today (Legacy Edition), fans and collectors can experience the alternate “real” mix of the album, unadorned and true to the spirit of the artist.